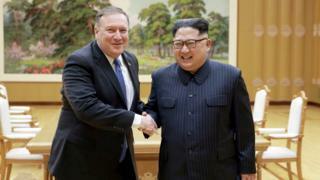 The planned summit between US President Donald Trump and Kim Jong-un depends on the North Korean leader, US Secretary of State Mike Pompeo has said. The event is scheduled for 12 June in Singapore, but the North has said it may cancel if the US insists on it giving up nuclear weapons. 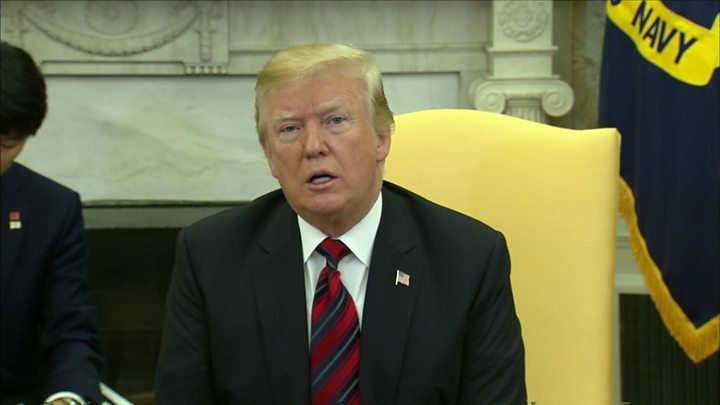 President Trump said the US would know next week if a summit would take place. Mr Pompeo said the US was prepared to walk away from the talks and a "bad deal" was not an option. It follows a historic meeting between the leaders of the Koreas in April. Mr Trump said at a meeting with South Korean President Moon Jae-in on Tuesday that the North must meet conditions for the summit to go ahead, and that "denuclearisation must take place". Meanwhile, a group of international journalists is travelling to North Korea's Punggye-ri nuclear test site to watch it being dismantled. The demolition has been billed as a goodwill gesture but may be delayed by bad weather. "That decision will ultimately be up to Chairman Kim," he said. "A bad deal is not an option. The American people are counting on us to get this right. If the right deal is not on the table, we will respectfully walk away. "Our posture will not change until we see credible steps taken toward the complete, verifiable and irreversible denuclearisation of the Korean peninsula." Mr Pompeo has twice met Mr Kim in Pyongyang. He said they had discussed their mutual goals for the talks. Mr Kim "has shared candidly that he understands that economic growth for his people, the well-being of his people, depends on a strategic shift", he added. How did the mood sour last week? North Korea cancelled high-level talks with South Korea, saying the South's joint military exercises with the US - which it had previously said it would tolerate - were a "provocation". Pyongyang then accused US National Security Adviser John Bolton of making "reckless statements" for his suggestion that the North could follow a "Libya model" of denuclearisation. That was a reference to Libya's former leader, Muammar Gaddafi, who agreed to give up nuclear weapons in 2003 and was later killed by Western-backed rebels. Mr Trump later denied the US would follow the "Libyan model" if an agreement was reached with North Korea. "That model would take place if we don't make a deal, most likely. But if we make a deal, I think Kim Jong-un is going to be very, very happy." Why does the Singapore summit matter so much? It would be historic as no sitting US president has ever met a North Korean leader. Mr Trump accepted North Korea's invitation for direct talks after more than a year of heated rhetoric and with global concern that hostilities might escalate into military confrontation. The New York Times reported on Sunday that Mr Trump was asking aides and advisers whether the meeting should go ahead. North Korea conducted several nuclear tests over the past few years and developed long-distance missiles which, it says, can carry nuclear bombs as far as the US mainland. Even then, is a deal likely? 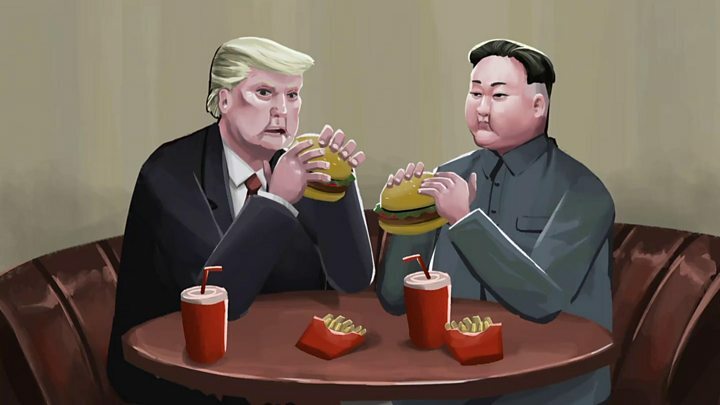 Many observers had argued before Mr Trump met Mr Moon that there was too much at stake for Washington and Pyongyang not to proceed with the Singapore summit. However, Pyongyang's professed commitment to "denuclearisation" is likely to differ from Washington's demand for "comprehensive, verifiable and irreversible" nuclear disarmament.